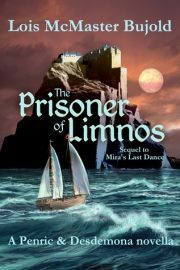 2017’s Prisoner of Limnos is the sixth novella in Lois McMaster Bujold’s Penric & Desdemona series. It follows directly on the events of Mira’s Last Dance, which in turn followed directly on the events of Penric’s Mission. The sorcerer Penric successfully smuggled General Adelis Arisaydia and the general’s half-sister Nikys out of Cedonia to Orbas. Events occurring during this smuggle have upset Nikys, with whom Penric is smitten. Then letters from his superiors arrive, demanding Penric return from his foreign adventures. Penric does what any reasonable person would do in his place: hare off on a side-quest. 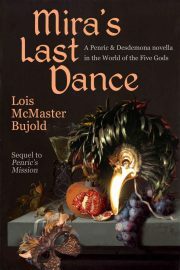 2017’s Mira’s Last Dance is the fifth instalment in Lois McMaster Bujold’s Penric & Desdemona series. 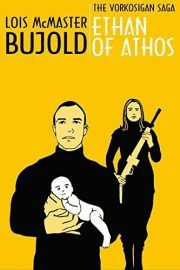 The series takes place in the setting of Bujold’s Five Gods novels. In the previous book, Penric was badly injured in a duel with a Cedonian sorcerer. His symbiotic demon Desdemona was able to keep Penric alive, but Penric and his two human companions, former General Arisaydia and the general’s sister Nikys, have been forced to pause in their flight from Cedonia while Penric heals. 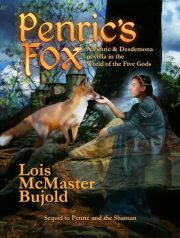 2017’s Penric’s Fox is the fifth piece published and the third piece by internal chronology in Lois McMaster’s Penric & Desdemona series. 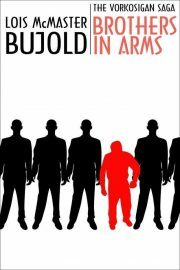 The series is set in Bujold’s Five Gods setting. What should have been a quiet afternoon of fishing and amiable conversation takes an unexpected turn. Penric and his shaman companion Inglis are conscripted to assist an inquirer in a murder investigation. Murder is always a grave matter. This particular murder is even more disquieting: the dead person is Learned Magal, a sorcerer. 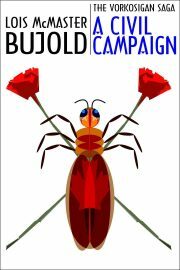 A Civil Campaign is almost certainly the 10th volume in the Miles Vorkosigan series, unless you’re one of those people who think that the Cordelia Naismith books are part of the series, in which case this book is the 12th. As far as I am concerned it’s the 10th. It’s reasonable to consider Cordelia’s adventures as prequel, right? Like Ethan of Athos, related but independent? I don’t know why I get requests at work not to overthink things. The affair of the Komarran mirror successfully concluded, Imperial Auditor Miles Vorkosigan is back on Barrayar. With no immediate Imperial business demanding his attention, Miles is free to invest all of his intellect and energy on one goal: winning the heart of the recently widowed Ekaterin Vorsoisson. He has a cunning plan. 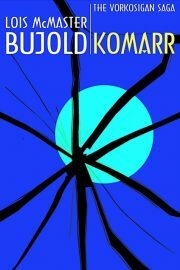 1998’s Komarr is the ninth volume in Lois McMaster Bujold’s Miles Vorkosigan series. Barrayaran-conquered Komarr depends on its soletta array, which concentrates the feeble output of its sun, for marginal habitability and slowly progressing terraforming. When half the array is wrecked by a colliding spacecraft, it’s up to Imperial Auditor Georg Vorthys to determine whether this was a tragic mishap or deliberate sabotage. Accompanying Vorthys is the most junior Imperial Auditor, Miles Vorkosigan. 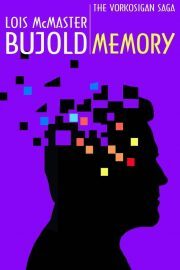 Memory is the eighth1 book in Lois McMaster Bujold’s Miles Vorkosigan series. Killed by an enemy grenade in a previous book, Miles turned out to be only mostly dead. After an extended recovery (and some complications) he returned to his role as Admiral Naismith of the Dendarii Mercenaries. But there were lingering health effects from his injuries. Simple prudence should have kept Miles off battlefields. It didn’t. One day Miles wakes from a seizure to discover that he had inadvertently lopped off the legs of the man his team was trying to rescue. Unwilling to admit to error or damaged health, Miles compounds his error by writing a false report on the incident and sending it to his boss, spymaster and ImpSec Chief Simon Illyan. The consequences are immediate and dire. 1989’s Brothers in Arms is the fourth book in the Miles Vorkosigan series. Admiral Miles Naismith’s Dendarii Mercenaries have a secret advantage; they are subsidized by the planet Barrayar. Naismith is also Miles Vorkosigan, son of Barrayar’s Lord Regent. Miles and the Dendarii put in at Earth to collect desperately needed funds. The funds should be waiting for them. They are not. 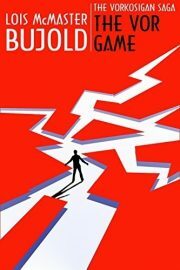 1990’s The Vor Game is the second of Lois McMaster Bujold’s Miles Vorkosigan novels. Four years after the events of The Warrior’s Apprentice, Miles graduates from the Academy. Given his personal history and family connections, one might expect him to be given some cushy assignment. Instead he is dispatched to serve as weatherman on Kyril Island, whose isolation is matched only by the region’s unfitness for human habitation. Still, how much trouble could one fresh graduate get into a place so sparsely peopled as Kyril Island? 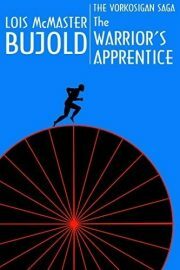 1986’s The Warrior’s Apprentice was Lois McMaster Bujold’s first Miles Vorkosigan novel. Miles was exposed to a lethal gas while still in the womb and his bones did not develop properly. They are short and brittle. He looks odd; he looks like a mutant, which is a bad thing to be on his native world of Barrayar. During Barrayar’s time of isolation from other human-settled worlds, mutants were killed at birth. Modern medicine has better answers, but hatred of muties (and of people who are visibly deformed or disabled) is still ingrained in Barrayaran custom. Mile must deal with daunting physical limitations. What may be worse is the disdain and even hatred of his fellow Barrayarans, who see his very existence as an affront to all that is right and good. Miles is an aristocrat; a period (or a lifetime) of military service is customary for Barrayaran aristocrats. Miles wants to be a soldier like his peers. He may lack physical prowess, but he has charm, brains, and cunning. Those sterling qualities are enough to take him to the top in the academic courses at the military academy … but don’t help him pass the final physical test. He breaks both legs on an obstacle course. There will be no Vor military career for Miles. What to do with the rest of his life? 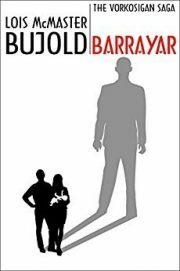 Lois McMaster Bujold’s 1991 Barrayar is the second Cordelia Vorkosigan novel. I am going to put off working out how to number it in the grander Vorkosigan Saga and Vorkosigan Universe sequences in the hope that nobody will notice if I am inconsistent1. The plan: Barrayaran Aral marries Betan Cordelia; Aral retires from active duty and the couple lives on their country estate, there to enjoy long, happy lives. The outcome: Emperor Ezar Vorbarra is dying and has one last task for Aral. It is a weighty task that will burden Aral and Cordelia for years to come. 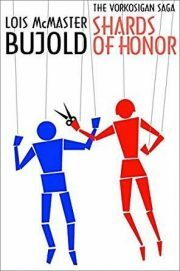 Lois McMaster Bujold’s 1986 debut novel Shards of Honor is the first Cordelia Vorkosigan book, as well as the first novel set in Bujold’s Vorkosiverse. A Betan exploratory mission has been sent through a newly discovered wormhole; they have discovered a terrestrial world suitable for colonization. Unfortunately for the Betans, they are the second group to discover Sergyar. The Barrayaran militarists were there first and they don’t want company.